Heading into the Olympic basketball competition, there are several teams that are a threat to medal, and maybe even contend with Team USA. As the Games ramp up, we’ll be providing looks at the strengths, weaknesses, and medal chances of these possible contenders. 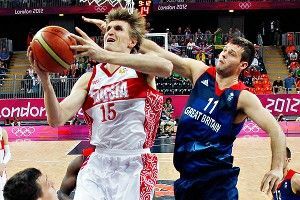 With a third-place finish in last year’s EuroBasket competition, Russia’s path to the London Olympics had to go through the 2012 FIBA World Olympic Qualifying Tournament. There they made quick work of the competition. Russia went undefeated in its four games, winning three by double digits. Looking at Russia’s roster, there are a number of well-known names (including Andrei Kirilenko) and talented players, which has Russian fans believing in their team’s medal chances. In the five games (one friendly and four qualifying) that Russia has played this year in the lead-up to the Olympics, the team has shown a reliance on 3-point shots. In these five games, 66 of Russia’s 179 field goal attempts (or 36.9 percent) were from beyond the arc. In fact, 53.9 percent of their shots have been labeled as jump shots, according to Synergy Sports. Much of their jump-shot-based offense comes from sets involving pin-down screens off the ball. This possession starts with Anton Ponkrashov bringing the basketball along the right side of the court. As he gets near the 3-point line, Dmitry Khvostov pops out on the opposite wing and receives the reversal. After the ball reversal, Russia sets up in a standard “double/single set” where the player under the basket — in this case Vitaly Fridzon — has the option to use either a single pin-down screen or a double pin-down screen to curl around and look to receive the ball. 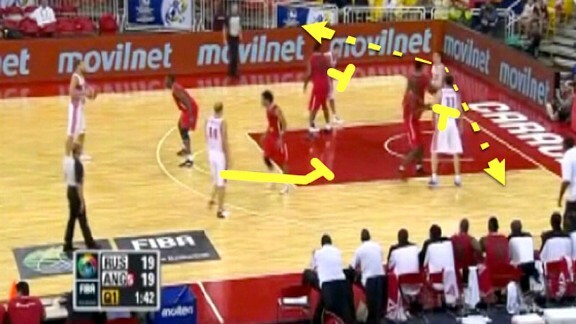 In this situation, Fridzon chooses the single pin-down screen and knocks down the jumper. Here is the play in real time. It’s easy to see the tough situation in which a double/single set like this one can put the defense. Jumping Fridzon’s route simply allows him to use the other screen with the defense now out of position. That’s exactly what happens here, and Russia is able to come away with two points. 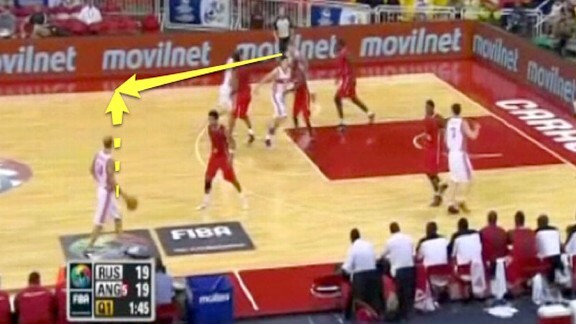 Watching Russia’s offense, their work off the basketball is very impressive. They are very good at reading defenders, reading the help defense, and using the screen in a way that gets them open at the 3-point line. They don’t use one particular set, but each of their looks has a unifying theme. Their screening off the basketball and solid ball movement will lead to a lot of open jump shots, and the key is whether or not they knock those shots down. Russia may feature better-known players in Andrei Kirilenko and Timofey Mozgov, but Alexey Shved and his play are going to be key for Russia. Shved, who just signed a contract with the Minnesota Timberwolves, is a very good shooter and a solid ball handler, and this leads to Russia often using him on ball screens. During the past five games, Shved had the ball on 57.1 percent of Russia’s pick-and-roll possessions. He’s dangerous in these situations because he can pass, he can shoot, and he can get to the rim. This allows him to read how the defense plays the pick and roll and simply take whatever he’s given. Because he’s a solid decision-maker, his choice is usually the right one. 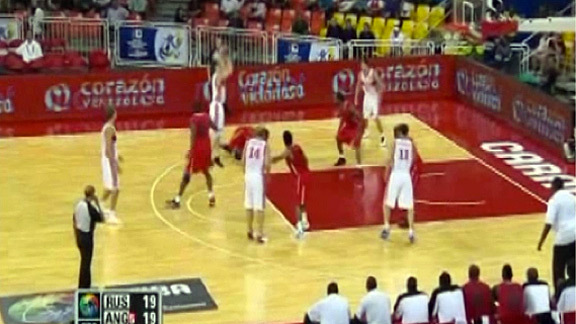 What’s also great is that, even in pick-and-roll situations, Russia’s fantastic movement of the ball is still there. This leads to a number of other scoring opportunities not normally seen with the two-man pick-and-roll. Contender. With the way Russia plays, they have a chance to beat the United States if they hit their shots. Team USA is strong in one-on-one defense, but with the way Russia moves without the ball and uses the pick-and-roll, they could give the Americans some trouble if those 3s are falling.